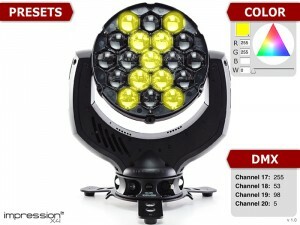 GLP German Light Products have launched a new iPad app for their impression X4 fixture. One of the versatile features of the impression X4 is that users can create their own pixel designs on the fly and store them directly into their control console. The new iPad app makes the process fast and easy by bringing up a mimic of the fixtures front lens layout. Users can tap individual lenses on and off to design the output that they would like. Simultaneously the app displays the corresponding DMX channels and values to be input to the controller for the physical fixture. An additional feature of the app is the colour picker allowing you to see color selection on top of any pattern for a real feel of how a final pattern will appear. The app is free to download from the Apple Store, and will soon be released for the iPhone and Android platforms. The impression X4 from GLP is part of the award winning series of fixtures and features 19 high powered RGBW LED’s giving a homogenized output across a full zoom range of 7 to 50 degrees. With its lightweight baseless design, the impression X4 packs a huge punch of output for its size. In picture: screenshots of the GLP X4 iPad app.